There’s plenty more to talk about regarding IAAPA 2015, which event ended today. For Recap #1 and the new games to find there, click here. Then check out the anticipated Point Blank X by Namco – as the chorus of comments go on this one, players are none too happy about what they see with the giant scaling reticules here, as well as the lives system but keep in mind, it is in beta so changes will likely occur. Surprise! Tekken 7 off of test and at the show. I still think this should be offered as a 2p kit as opposed to the Versus linked for US operators to want to embrace it with a pending console release (no date announced for consoles but just knowing it is coming hurts). Looks beautiful in person though. Let’s throw in a still photo here and there. 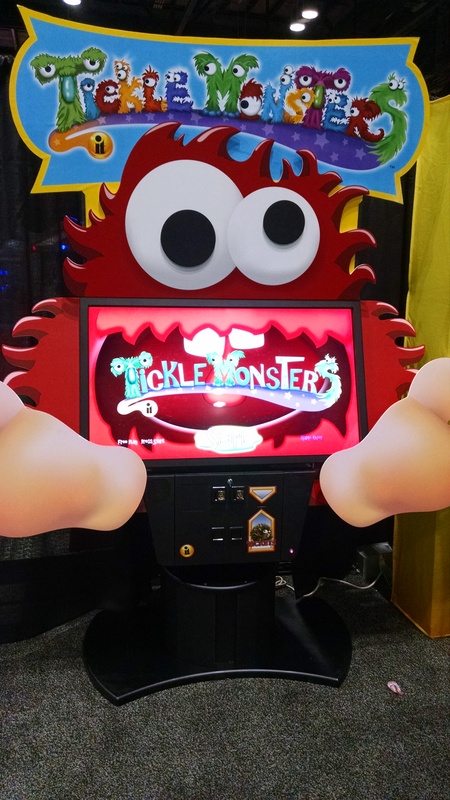 Incredible Technologies continues to showcase their line of videmption titles in their custom touchscreen cabinet, this time introducing a new game called Tickle Monsters. While obviously pulling some inspiration from Muppets, it doesn’t cross that line all the way so it’s all good – “tickle” the on screen monster by moving your hands on its feet to win tickets. And a tour of the other Namco products including the Star Wars Battle Pod update, Time Crisis 5 Standard (as I predicted! ), Ace Angler (surprise brought in from Japan), Whack ‘Em Funky Gators, Pac-Man Air Hockey and a little more footage I found on accident of the World’s Largest Pac-Man & Friends game. I only realized today that the “& Friends” is a part of the title. I also didn’t realize that a new version of Pac-Man Battle Royale was there – I just thought it was an odd ‘got to fill up booth space’ thing but next to Ace Angler were the pedestals to the Pac-Man Battle Royale Deluxe game but it was connected to an odd looking TV stand and TV instead of the big marquee and screen the game came with at first. According to the BN catalog, this is a new release that allows a venue to connect whatever screen they want to the game, ala Golden Tee pedestal. Let’s go for another photo here, this time from the Valley Dynamo booth. The Black Hole table pictured here graced the cover of a Replay Magazine earlier this year but oddly enough, the article didn’t really get into much detail about this new table, which was left for this show. The main difference this has going for it is in the overhead score bar. On each side is an LCD screen that shows scoring in front of animations but if you look really close, you can see a camera under the bar. This is used to show “instant replay” events after one player makes a goal. The table also blasts a gust of air at the losing player using that slot right beneath the screen. Only suggestion I’d make is to have an announcer say “Instant replay!” or “Let’s watch that again” to help draw attention to the feature as I might not have noticed it unless the sales rep had said something. Dynamo said that this was outearning their popular FireStorm table by wide margins so expect this to be at the forefront of their marketing in the near future. And the new Game of Thrones and KISS pinball tables by Stern Pinball. While I’ve not watched/read GoT so the characters are unknown to me, the table had some cool elements to it. I liked the sword fight video mode and the multiball on the LE was fun. 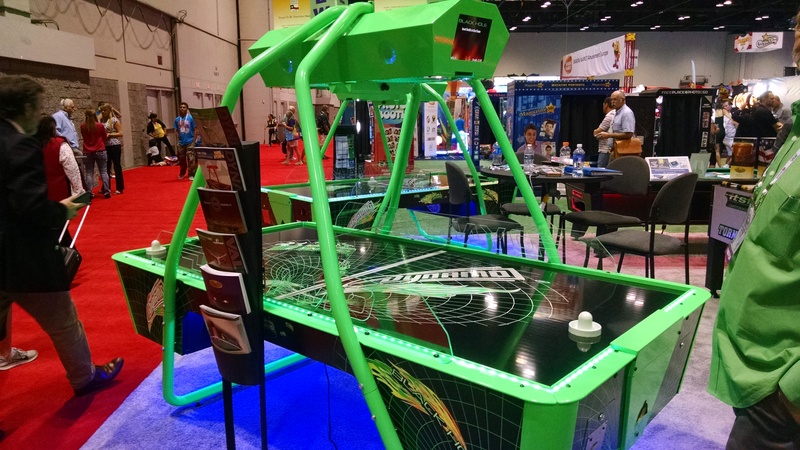 Let’s end out on a gif of an air hockey table found at a Chinese manufacturer booth whose name I can’t recall. For many of these newcomers, I think they overlook the importance at times of keeping it simple and so we get these games that are overloaded with LEDs. Still, the hockey stick under the table and the attached mallets was a little different. I wonder how this would stack up on location as far as durability and earnings go. I’m not done yet! More videos and photos to come so stay tuned! I was looking forward to playing the point blank x but really hope the version shown is far from complete. The game is somewhat laggy and even had slowdown and bad screen tearing at times. The scaling down crosshair shots in normal mode made the slowdown really bad, but at least in classic mode it didn’t do the crosshairs and ran a little better. Still in classic the game didn’t 100% keep up with frenetic rapid gun movement making the game unplayable on intense levels. Normal mode really felt like they just slapped it together real quick a couple nights before the show, but that is to be expected of a early version game. I was 100% sure to be buying one of these as the point blank 2 I have still does very well. But playing it has brought concerns. I will need to see a more complete version to be sure these issues were addressed before I can make that commitment now. When I was first told about this game they described it as “not much more than a drawing on a napkin at this point” although the cabinet was already finished. So I do imagine there will be some time before it is released and hopefully every issue you noticed will be resolved. Reading about that Tekken 7 bit was somewhat painful to digest, but the fighting game scene is no longer isolated to the arcade format and as such, it makes me wonder if this is the last one we’ll be seeing.